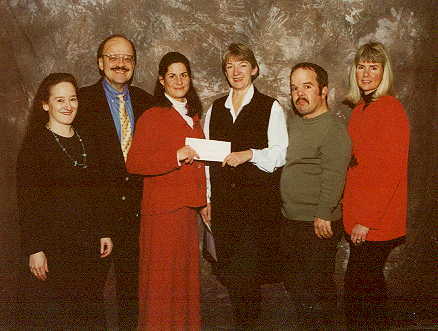 The Grand Rapids Foundation for the purpose of planning and presenting the Thornapple River Watershed Management Short Course in the Fall of 1999. The award was made on March 3, 1999, by Judge Janet Haynes (representing GR foundation) to Renee Van Houten, board president of TRWG, John Zadvinskis, Nancy Bell Harmony, Jim Williamson (all board members) and Patricia, director of educational programs for TRWG. Judge Janet Haynes (right of center) presents the check to fund the Short Course to Renee Van Houten, President of the Board, Thornapple River Watershed Group. The Short Course, developed by MSU Extension, is a 20 hour class in watershed management that includes lecture, small group activities, and field work. It was very successful, presented in the Fall of 1999, on September 9, 16, 23, 30 (Thursday evenings, 6 p.m.-10 p.m.) and October 2 (Saturday, from 8 a.m. to noon). Caledonia High School, Caledonia, Michigan, generously donated class space and facilities for the course. The Watershed Management Short Course is an exciting concept in watershed management programming with content designed to be localized for each location in which it is offered. To accomplish this, Michigan State University Extension partners with local agencies and organizations to produce a unique course that is relevant to local watershed and land use issues and thus more beneficial to citizens and decision makers. This program was presented twice before, in Dowagiac (1997) and in Kalamazoo (1998). Each program was designed to focus on local hydrology, geology, land use, and basic watershed information. The program developed watershed management skills and networks in each of these regions of southwest Michigan. The Watershed Management Short Course targeted elected and appointed officials at the township, county, and municipal levels, grassroots watershed groups, developers, landowners, educators, and other interested citizens in the Thornapple River Watershed. Participants came from Barry, Kent, Ottawa and Eaton counties. The Thornapple River Watershed group worked in partnership with Kara Griffith of Kent-MSU Extension. Jane Herbert (course developer) of KBS-MSU Extension advisedTRWG and performed pre and post evaluation for the course. If you are interested in learning more about the Watershed Management Short Course, call Jane Herbert at the KBS-MSU Extension office(616-671-2412). Session I September 9, 1999. Session II September 16, 1999. Session III September 23, 1999. Session IV September 30, 1999.